At EMI records today in a songwriting workshop. This is some amazing stuff we’re hearing. On another note, I had a similar post to this last year. 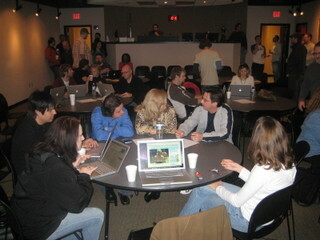 How many Apple laptops can you find in this picture taken today at EMI in a room of worship leaders? Sorry Ed. Almost, but not quite. At least not by my count. Dude you made my day today. I wasn’t having a good one, and when you hit me with the video chat at re:create, it was awesome. Thanks bro! I was wrong on the first comment. There are eight. I didn’t see the black one way in the back.